With data the new competitive battleground, businesses that take advantage of their data will be the leaders; those that do not will fall behind. But gaining an advantage is a more difficult technical challenge than ever because your business requirements are ever-changing, your analytic workloads are exploding, and your data is now widely-distributed across on-premises, big data, the Internet of Things, and the Cloud. 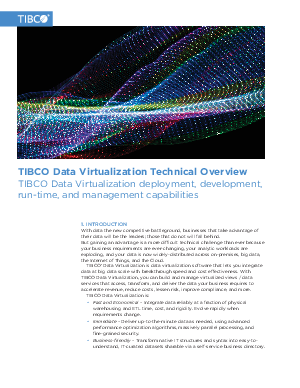 Download this whitepaper to read more on TIBCO's Data Virtualization.